Projections for mobile group and event booking and the growth of mobile commerce in the travel industry. While online commerce has existed for decades now (fun fact – Amazon was founded in 1995),2 the growth of online retail has exploded much more recently, extending to growth in mobile commerce. 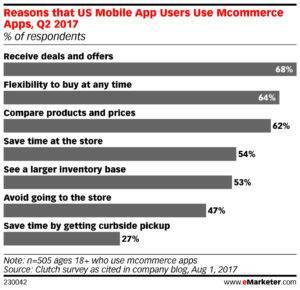 Data shows the top reasons people purchase on mobile devices are to receive deals and offers (68%), for the flexibility of purchase (64%), and ease of comparing products/prices (62%)3. Each reason could just as easily translate to a reason for booking an event or group booking on mobile. So we ask, how long will it be before online group and event booking extends to mobile booking… and are you ready? To help give an idea of where the mobile commerce traffic is coming from, you can view data from the top ten travel properties online, broken down by total unique visitors as well as mobile visitors. 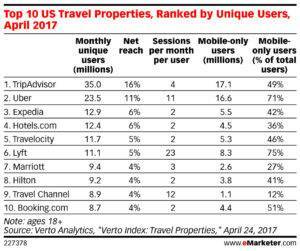 Not surprisingly, (excluding ride sharing apps) you’re seeing TripAdvisor, the top OTAs, and the top hotel brands garnering a significant amount of mobile traffic last year. We have to imagine that this traffic is not just transient room bookings, but surely event research as well – and soon, even a greater percentage of group and event bookings. Does your website allow the user to do the same tasks as the desktop version? If someone is using your desktop version and later visits via mobile, they’ll expect to be able to still submit that same RFP or booking request. Is your website mobile friendly? Even if you have an app, you’ll notice a large percentage of your website traffic is coming from mobile as people are browsing and you’ll want your mobile experience to stand the test. Do you regularly test your website on both iPhone and Android? Operating systems are regularly changing and updating, so you’ll want to make sure that your mobile website is always up to date on the most popular operating systems. If mobile travel sales are going to hit 50% of all travel sales by 2020, we need to improve our internal processes to be able to take advantage of that new desire to make a purchase online. It’s important for us to remember that online booking is still new and that shifting online booking for small events first is a good step to help acclimate planners to this new way of booking. Like any other change, we need to expect that we will have early adaptors to the new process and laggards, who even still prefer in-person meetings before booking an event. Can you book group business via mobile? By enabling functionality to book events right on a mobile device, you can empower planners to make decisions and book on their time, outside of regular business hours. With direct event booking, the reduction in back and forth time for proposals alone will increase conversion… and make people on a tight timeline incredibly happy. It’s likely going to be a while before mobile booking becomes a trend for large events, which still require a significant amount of information up front as well as back and forth correspondence between the planner and the property. But what if the experience could become more seamless? How easy is it to submit an RFP on mobile? Particularly when it comes to mobile commerce, it is imperative that any submission form appears as simple as possible. People are more prone to errors when typing on a mobile phone and more likely to abandon any form that appears to be too lengthy or cumbersome. How many steps does it take to submit an RFP or book an event via mobile? As with any other online conversion, the fewer steps there are, the less likely someone is to fall off midway through the process. Reducing the number of pages, clicks, and information required will help speed up the process and increase conversion. How can you improve mobile interaction? By hosting all event specifics in a shared portal, you can keep all of the information from both parties in one place for easy reference and collaboration, even when people are on-the-go. Online group and event booking are expected to be a growing trend in travel technology in the near future. In anticipation of the significant increase in mobile traffic and purchases over the next few years, it is smart to turn our focus to not just online booking, but mobile online booking. Starting with booking small events on mobile, you can help your hotel get ahead of the curve with the early adopters of this functionality – and increase your conversion. For more insight into driving website conversion, check out our blog post Improving Your Website’s Group Booking Conversion. What Are Your Event Planning New Year’s Resolutions?